Klinenberg (Sociology/New York Univ. ; Fighting for Air: The Battle to Control America's Media, 2007, etc.) explores why “more than 50 percent of American adults are single”—and why the usually prefer to live that way. 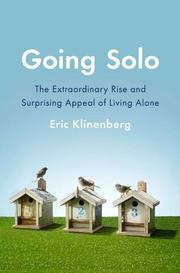 Solo living appears to be a global phenomenon that has skyrocketed over the past decade. The author examines both ends of the age spectrum in an attempt to understand the social implication of this trend. He finds that among relatively affluent young adults in the 25-to-34 age bracket, living solo is seen as a rite of passage into adulthood—a period allowing more sexual freedom, a chance to explore relationships without commitment and a major focus on career building. A similar increase in solitary living is becoming the norm among the elderly, where one in three people over 65 live alone—compared to one in 10 in 1950. This book is an outgrowth of a study conducted by Klinenberg following the publication of his book Heat Wave (2003), which investigated the tragic deaths of senior citizens during the extraordinary heat wave in Chicago in 1995. Interviewing elderly Manhattan residents who live alone, the author found that they preferred this to dependence on their children because of their strong belief in self-reliance. They reject the alternative of assisted living as prohibitively expensive and deplore the conditions in most nursing homes. Klinenberg suggests that public support is needed to provide affordable, urban assisted-living facilities in which the elderly can maintain their independence for as long as possible. An optimistic look at shifting social priorities that need not threaten our fundamental values.